This vegan korma is made with fresh vegetables and chickpeas, simmered in an Indian-inspired coconut curry sauce and topped with roasted cashews and fresh cilantro. Sometimes I don’t understand myself at all. This is one of those recipes which, once I made it, I was kicking myself because it was just too easy. Kicking myself (1) for not having made it before, and (2) for having made it now, and bestowed upon myself the knowledge of just how easy it is. See. Total nonsense. 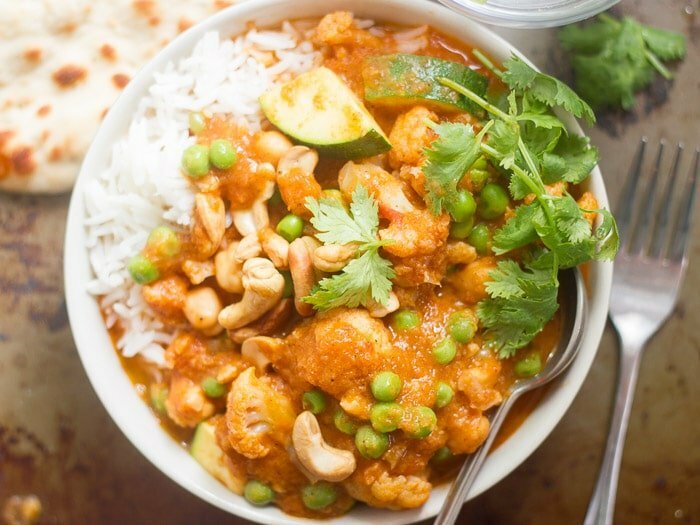 It’s always a little bit of a surprise to discover some dish, like this one, that you’ve ordered many times on nights out, and were always really impressed with, is really easy to make at home. And it was really easy. Took less than thirty minutes and the ingredients list is way shorter than you’d think. Now, before the Indian food police come after me, I acknowledge the fact that this might not be the most authentic veggie korma. That’s okay. It is after all, a vegan korma, and, you know, if I wanted all my food to be authentic, this blog wouldn’t be vegan. (Really, I’ve got more than one recipe with “steak” in the title.) Having said that, and being an Indian food lover, I wouldn’t have known this was a simplified version of the dish had it been served to me. As far at it being a vegan version of the dish, I’m totally okay with swapping out coconut milk for heavy cream. In fact, I’ll go so far as to say coconut milk generally tastes better than heavy cream. 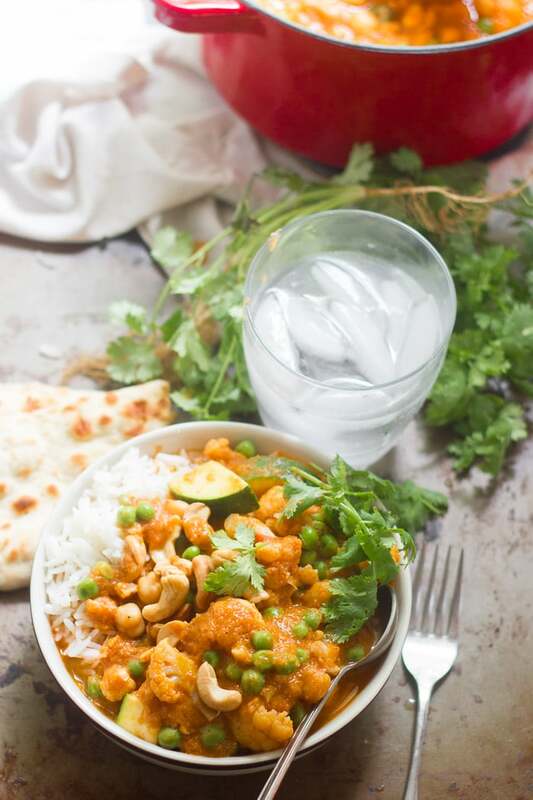 This vegan korma is made with fresh vegetables and chickpeas, simmered in an Indian curry coconut sauce and topped with roasted cashews and fresh cilantro. Place the tomatoes, onion, garlic and ginger into a blender or food processor. Puree until smooth, stopping to scrape down the sides of bowl as needed. Transfer the tomato mixture to large saucepan. Add the coconut milk, garam masala, paprika, lemon juice, chili paste, salt and pepper. Taste-test and add sugar if needed. Stir to blend and place over medium-high heat. 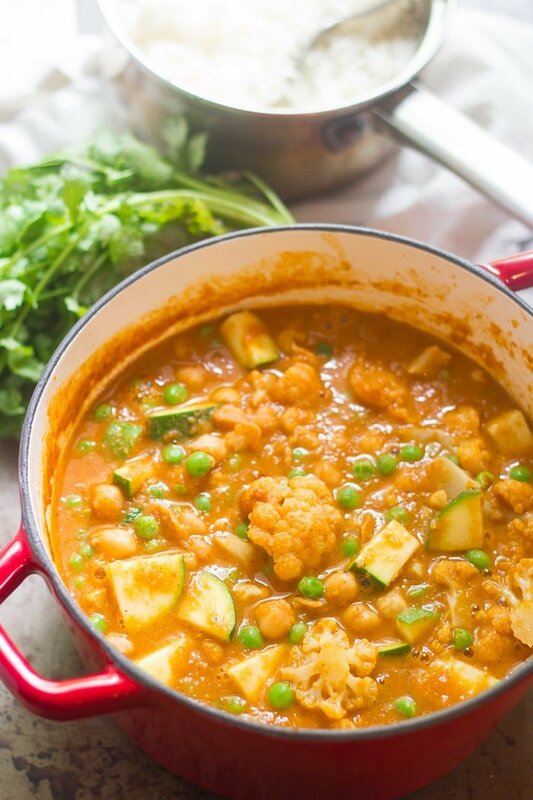 Add the cauliflower and chickpeas and bring to a simmer. Lower heat and allow to simmer, uncovered, until cauliflower is tender-crisp, 15-20 minutes, stirring occasionally. Add peas and zucchini. Continue to simmer, stirring occasionally, until zucchini and cauliflower are tender, about 5 minutes more. 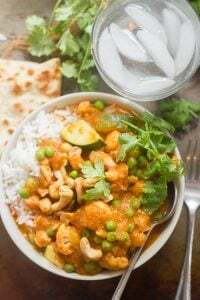 Divide onto plates or bowls and top with cashews and cilantro. Serve with rice. Feel free to substitute your favorite veggies in this recipe, keeping in mind that you might need to adjust cook times to get your veggies tender. You will need about 5 cups of veggies total (including chickpeas). It was both delicious and super easy! I hope you agree. :) Enjoy! This WAS super easy and delicious! First meal I have made from your site since moving back to my native land in Europe. Can’t wait to have the pantry stocked – it will then be forever vegan!! 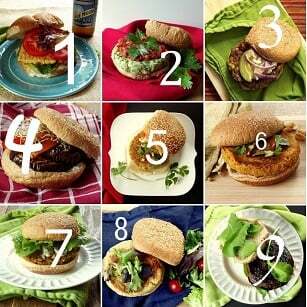 Thank you for all your sharing and great food inspiration! Yay! I’m so glad you enjoyed it!! Thanks so much Mette! Made this last night, it was SO good! I love your recipes. Yay! Glad you enjoyed it! Thanks Pam! This is definitely a delicious dish that will be making an appearance in my kitchen. It is perfect for myself and my vegetarian family! Awesome! Thanks Thalia – I hope you and your family enjoy it as much as I did! This recipe looks delicious and versatile – seems as though you could use whatever veggies you have on hand and it would still taste great! Thanks! You totally could! I’m planning on trying a few different variations myself. Thanks Carey! Wow, that looks so much nicer than all the artificially coloured ones you get ready made at the store. And also, I’d say that the coconut milk is possibly more authentic than the heavy cream. Haha! Thank you! I think I’ve seen the ones you’re talking about – they’re pretty vivid. I’m a one pot cook and have just received great comments after making this recipe – Recommend it! Glad to hear it! Thanks so much for giving this a try, and for stopping back to let me know it was a hit! I din’t realize how old this recipe was! I made this for dinner last night and it was so delicious! Even my carnivore boyfriend loved it! I’m so glad to hear that! Thanks Jenny!! I’ve been making this with Mae Ploy yellow curry paste since becoming vegan. I had everything prepped waiting for the coconut milk – and found I only had ‘light’! I found this searching to see if any used low fat- of course they don’t. I now have more of a stew without so much coconut flavor. Delicious! Thank you! It was close to perfect the first time around which almost never happens for me. Leftovers out of the fridge are amazing, too. I’m so glad you like it!! Thanks so much Matt! I made this over the weekend and now eating the leftovers for lunch. I absolutely loooove this!!! 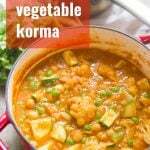 Vegetable Korma is my favorite Indian dish and it’s so nice to have an easy recipe to go to. I used a mix of frozen cauliflower, broccoli and carrots along with the zucchini and peas. I also sprinkled in some cherry infused Crasisins. Soooooo yummy! Thank you!!!! Yay!! I’m so happy to hear that! Thanks Jennifer! Made this tonight and loved it, thanks for sharing! Awesome!! I’m so glad to hear it! Thanks Ginny! Jist become vegan so looking for recipes online… I’ll be making this over the next week, however I don’t like cauliflower so will use other veg! You could use just about anything! I hope you enjoy it and I’d love to hear how it turns out!! Will reduced fat coconut milk work in this recipe? I think so! Please let me know how it works out if you try! Really nice. My fam sucked it back and went for seconds! I made this with a brown basmati for an extra layer of nutty flavour. Very satisfying. I also cooked down the purée mixture along with the masala(before adding coconut milk)to develop the flavours a bit more before adding the rest. This works Excellent for a quick weeknite meal. We did not miss the meat at all. It’s going into the rotation! Glad it was a hit! Thanks Lisa! Hi there! This looks awesome! I might have missed it but it possible to freeze this? I think so, but the texture might change a bit. That sometimes happens with coconut milk! Thanks a bunch, this was so fresh tasting! I added a little jalapeno to the tomato/onion blend, and it was perfect. I used about 1/2 teaspoon of agave and I think next time I might add a pinch more. I love the versatility, so I threw a few carrots in for extra crunch and sweetness. Cheers!! That sounds delicious! I’m so glad you enjoyed it! Yum! Easy to make despite the number of spices etc. Used up all the veggies I needed to in it. I steamed the veggies and served curry with saffron rice. Everyone liked it. Sounds like a delicious meal! Glad you enjoyed it! I made this a year ago for my sisters family, who are vegan. It was an unbelievable hit. I make it on a regular basis for myself and any friend that comes for dinner. This is easy, delicious and will leave your guests wanting more! Awesome!! I’m so glad you’re enjoying it! Thanks Lori!